​This exceptional 21 feet wide gated townhouse is located in the beautiful Hamilton Heights Historic District. Designed by William Mowbray and built by William H.De Forest Jr. in 1890, it has preserved its original single family layout and retains innumerable original elements, including magnificent unaltered fireplace mantelpieces. Fully renovated, the garden level features a bedroom with full bath, the laundry and an impressive custom gourmet kitchen with access to the rear garden, an oasis from Manhattan hustle and bustle. The front garden can be accessed from this floor by the service entrance under the stoop. Both gardens have been recently remodeled. 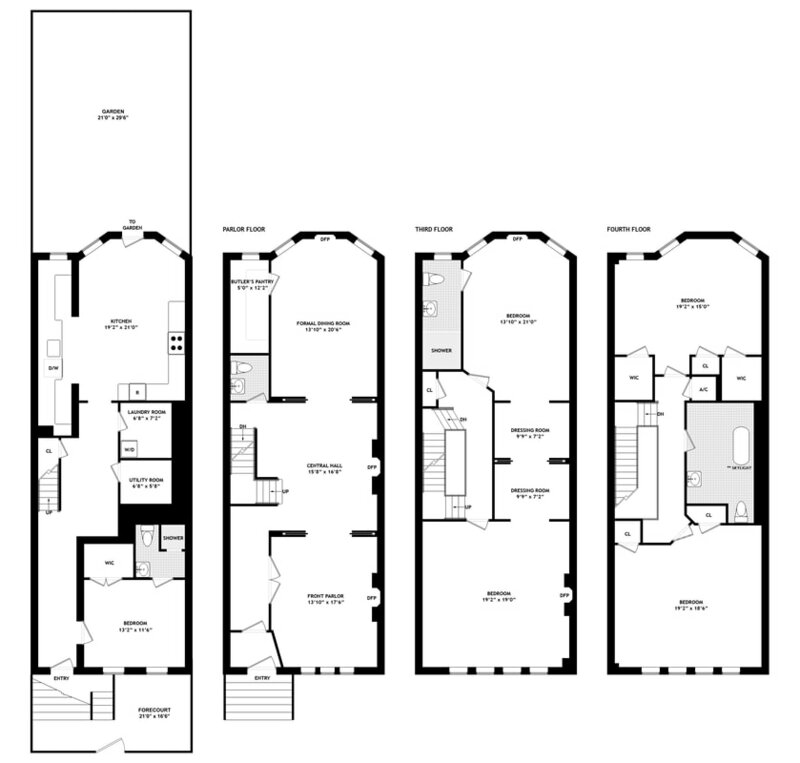 The parlor floor boasts high ceilings, three flowing rooms with wide pocket doors openings : the front parlor, the central parlor and the formal dining room with an adjacent butler's pantry, as well as a powder room. The two bedrooms on the third floor are connected by a double dressing area. Leaving the middle pocket door open gives an elegant loft-like feel. The full windowed bathroom features a spacious steam shower. A large skylight on the fourth floor brings natural light to the wide staircase. This top floor features 2 bedrooms and a dramatic full bathroom with marble tub and sink. It is equipped with central A/C.